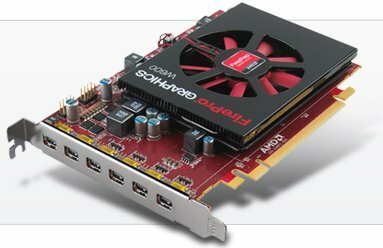 AMD (NYSE: AMD) today announced immediate availability of the AMD FirePro™ W600 professional graphics card, the company’s first professional graphics card to leverage AMD’s Graphics Core Next architecture and 28nm production technology, for use in high-resolution, content-rich, multi-screen display wall environments. With this launch, AMD is addressing a growing need for large, dynamic screens that are easily updated with new content. System integrators and display installation builders are rapidly replacing single, low-resolution displays with the latest in HD LED, LCD and plasma technologies that can reach audiences on massive, high-resolution screens grouped together to form a single image or divided into multiple streams of information. The thinner, lighter and increasingly cost-effective nature of these technologies makes multi-screen display walls attractive to a range of companies, including those in the advertising, entertainment, operations, security, training and video-conferencing markets. Not only is the AMD FirePro™ W600 professional graphics card designed to meet these needs, but also to empower the latest cutting-edge technology from AMD’s trusted display technology partners. "The core philosophy of everything we do here at Mitsubsihi Electric is quality. But we realize that the quality of our display solutions means nothing if we can't deliver the content that users need,” said Peter van Dijk, business development manager, Mitsubishi Electric Europe. “That's why the AMD FirePro™ W600 graphics card in combination with the Composer/Play-Out system is such an important part of our offering. With its ability to drive multiple displays, deliver breathtaking 3D, video and interactive content, the W600 delivers the ultimate in performance and the ultimate in quality - no matter what the application." AMD PowerTune technology that dynamically optimizes power consumption during operation and AMD ZeroCore Power technology that provides reduced power consumption at idle. All AMD FirePro™ professional graphics solutions for display walls are designed for multi-screen configurations that require the highest visual quality, reliability and multimedia application performance. The AMD FirePro™ W600 professional graphics card joins a range of products for configuring displays with two to six screens, including the ATI FirePro™ 2460, AMD FirePro™ 2270, AMD FirePro™ V7900 and ATI FirePro™ V9800. AMD is exhibiting at InfoComm 2012 June 13-15, booth #N1868 in the Digital Signage Pavilion, and is showcasing several multi-monitor display wall demos powered by AMD FirePro™ W600 and technology partners InfiniteZ, Mitsubishi Electric MegaView, Scalable Display Technologies and Ventuz Technology AG.